I’ve been hoping, for a very long time, for Pope Francis, or someone with his moral authority and credibility, to come to Philadelphia and weigh in on issues that have long been important to black Catholics and to other African Americans, in our city, and nationwide. This essay originally ran in the Philadelphia Tribune and is republished with permission. You see, I’ve been a Catholic all of my life: Catholic grade school, Catholic high school, Catholic undergraduate university. In fact, my old Catholic church, Our Lady of the Blessed Sacrament, a few years following my graduation from eighth grade, was closed by the Archdiocese of Philadelphia, during the early part of what seemed to many of us to have been a mean-spirited effort to close all Catholic churches and schools in black communities across the city. Indeed, our old Catholic church, which had been located in North Central Philadelphia at Broad and Fairmount, is now Rev. Herb Lusk’s Greater Exodus Baptist Church. Both the Blessed Sacrament nuns, who taught us at the school, and the Holy Ghost priests, who led the church and parish, were members of missionary orders. As such, they routinely rotated among various nations in Sub-Saharan Africa and Native American communities in New Mexico and back, again, to save our “heathen souls” in North and South Philly. I had no appreciation, back then, of black Philadelphians’ long history of involvement in the Catholic church. I didn’t know that there had been practicing black Catholics, here, in the city, prior to the arrival of many European immigrant groups. I had been unaware that they prayed at places such as Old St. Joseph, Old St. Mary and Holy Trinity, as far back as the early 1700s, even though they were usually permitted only to worship separately from white Catholics, and when actually allowed to pray together with whites, were restricted to designated areas at the rear of those churches. Who knew? Because I was the first Catholic in our immediate family, the religion, early on, was a huge mystery to me. I didn’t understand why the priests and nuns always wore black, from head-to-toe, every day. I had no clue why they used the Latin language during church services, and certainly didn’t understand why every single one of them, in our 99-percent African-American, 1-percent black Cuban church and school, was of European descent. I eventually became accustomed to all of that. But the whole thing was a continuing source of amazement to my friends in the Richard Allen housing projects, where I grew up. Catholics in my community were very rare. I remember, years later, as a scholarship student at the ironically North Philadelphia-situated St. Joseph’s Prep, being confronted, in the school’s hallway, by an elderly Jesuit priest, a Latin teacher. I imagine that, because I was one of only two black students in my year, in a school whose student body had been totally white just four years prior to my arrival, he was still having a difficult time accepting that I could have possibly been a student at the Prep. When I responded, accurately, to his impromptu quiz about my enrollment status, and reminded him that I was actually a student in his Latin class and not a random neighborhood intruder, he begrudgingly reversed his original decision to have me evicted from the premises. It was like that a lot during my four years at the school. In a Twilight Zone kind of way, I’m now a member of the Prep’s board, and the school has a diversity management program in place, a new president with successful experience gained in the predominantly African-American Cristo Rey School in Baltimore; and there is now a growing cross-section of black, Hispanic and Asian students at the Prep. But it was different then, and there are still vestiges of that discriminatory treatment of black people, and race-based marginalization, evident in today’s Catholic church. In fact, it’s been widely reported that the number of black Catholics in the Archdiocese of Philadelphia has fallen from 40,000 people in the 1960s, to about 20,000, today; that there are just 16 primarily black Philadelphia Catholic churches, and that, among the Archdiocese’s 680 active priests, 14 are black, but only four are actually African Americans. Four. The national data are similarly disappointing, with black priests constituting about one-half of 1 percent of the nation’s 38,800 Catholic priests. These trends are in stark contrast with the fact that the continent, across the globe, with the fastest-growing Catholic population happens to be Africa, whose Catholic count has risen by 238 percent since 1980, approaching 200 million worshipers, and is expected to grow to 320 million over the next 10 years. One would think that Church leaders would recognize a significant, corresponding, upside potential for U.S. Catholic membership growth in the virtually untapped African-American community. Despite the decline of their numbers in recent decades, there is great optimism among black Catholics, and among other African Americans, about the imminent arrival in Philadelphia of a bold and charismatic pope. There is excitement that he has not hesitated to weigh in on issues of social justice, economic equity, support for refugees and homeless, worldwide and “non-traditional” areas such as the perils of climate change. 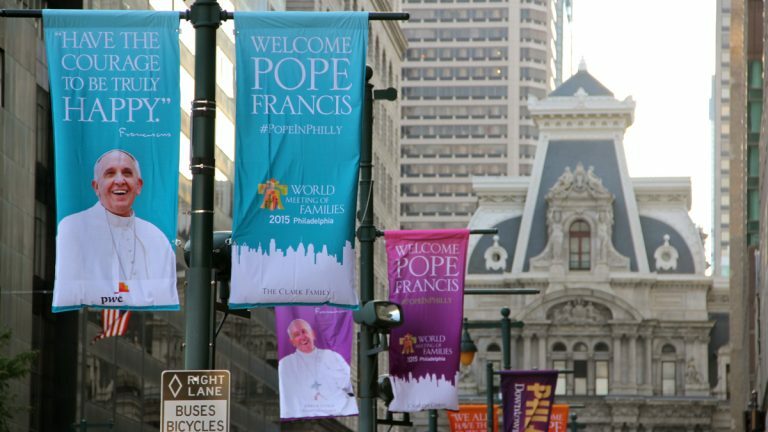 They are encouraged because Francis’ message transcends Catholicism and extends to topics impacting all of humanity. We have said to World Meeting of Families and Archdiocesan leaders, in collaborative discussions, that we are confident that if Pope Francis begins to weigh in during his visit on the social and economic disparities that continue to plague 45 million black Americans, it will resonate widely. We also believe it will stimulate broader understanding of what have long been our national community’s most critical issues, and lead to meaningful actions to address those problems, by both public and private-sector leaders. We believe that Pope Francis will be surprised, for example, to learn that even in a nation with the globe’s highest incarceration rate, black people continue to be incarcerated at eight times the rate of whites, for the same non-violent crimes. We have to think he will be moved to speak out when he fully realizes that the unemployment rate for blacks has consistently been twice as high as the nation’s white unemployment rate, for at least the past 50 years; that black Americans’ median family income is only 61 percent of mainstream income; that 45.8 percent of black children under age 6 live in poverty, three times the percentage of white children; and that the median net worth of black families stands at $4,900, as compared to $97,000 for the median white household. Given the pope’s previous support for issues resolution in places such as Cuba (population 11.3 million); Israel (population 8 million); and Syria (population 22.8 million), we believe it is entirely reasonable to expect him to consider adding the circumstances that have long impeded the social and economic development of black Americans (population 45 million) to his global agenda. A. Bruce Crawley is president and principal owner of Millennium 3 Management, Inc.